Kerastase Elixir Ultime Sublime Cleansing Oil Shampoo 8.5oz - SEALED & FRESH! Gently cleanses, while nourishing and purifying hair. Strengthens hair, leaving it soft and shiny. 4.5 out of 5 stars - Kerastase Elixir Ultime Sublime Cleansing Oil Shampoo 8.5oz - SEALED & FRESH! 12 product ratings12 product ratings - Kerastase Elixir Ultime Sublime Cleansing Oil Shampoo 8.5oz - SEALED & FRESH! Kerastase Nutritive Bain Satin 1 2.7 OzKerastase Nutritive Bain Satin 1 2.7 Oz. Wash to develop lather and rinse thoroughly with warm water. Más de 35 años en el sector de la peluquería. Los Gastos de envio Nacionales sí calcularán ACORDE al peso del articulo / Adquirido os / os basándose en la siguiente tabla. BAIN SATIN 1. - Lipids: protect the fiber to the tip, protecting the hair from the drying process. Wash your hair nourished from the root and protects hair from dryness. Dealing in star shape on the scalp and wet hair. BAIN ANTI-PELLICULAIRE. Proceed to a second application of appropriate Dermocalm Bain massaging the palm of your hands. Salicylic Acid: keratolytic active, removes dead cells from the skin surface. Más de 35 años en el sector de la peluquería. Kerastase Cristalliste Bain Cristal Shampoo 8.5 oz. You get hair that moves, shines and grows healthy and long. It is ideal for fine hair that can get easily weighed down by more traditional shampoo formulas. With no colorants, silicone or parabens, this product is ideal if you suffer from flat, lifeless hair. Complete nutrition shampoo for normal to slightly sensitized hair. Hydration of the scalp. Soft, supple and light hair. BAIN CHROMATIQUE RICHE. - They are different formulas and are adapted to the type of hair of each one. One of these differences is the wash base, softer in the case of BAIN CHROMATIQUE RICHE. Más de 35 años en el sector de la peluquería. BAIN PREVENTION. Carry out a second application and leave on for 3 minutes. Wash to develop lather and rinse thoroughly with cold water. Más de 35 años en el sector de la peluquería. Los Gastos de envio Nacionales sí calcularán ACORDE al peso del articulo / Adquirido os / os basándose en la siguiente tabla. Kerastase Nutritive Bain Satin 2 Irisome Shampoo 8.5 oz. BAIN CHROMA RICHE. Más de 35 años en el sector de la peluquería. Los Gastos de envio Nacionales sí calcularán ACORDE al peso del articulo / Adquirido os / os basándose en la siguiente tabla L ista de Favoritos! Lipids: protect the fiber to the tip, protecting the hair from the drying process. Wash your hair nourished from the root and protects hair from dryness. Dealing in star shape on the scalp and wet hair. When your scalp gets out of balance, it can dry out hair or lead to weak hair that breaks easily. Through cleansing the scalp with abyssine and balancing it with a blend of Vitamin A and Vitamin E, you get smooth hair that moves. Kerastase Elixir Ultime Sublime Cleansing Oil Shampoo 8.5oz - SEALED! Gently cleanses, while nourishing and purifying hair. FULL SIZE 8.5oz -- MANUFACTURE SEALED. What else you need to know. 4.5 out of 5 stars - Kerastase Elixir Ultime Sublime Cleansing Oil Shampoo 8.5oz - SEALED! 12 product ratings12 product ratings - Kerastase Elixir Ultime Sublime Cleansing Oil Shampoo 8.5oz - SEALED! KERASTASE CHRONOLOGISTE PRE SHAMPOO, REVITALIZING EXFOLIATING CARE, 200ml/6.8oz! 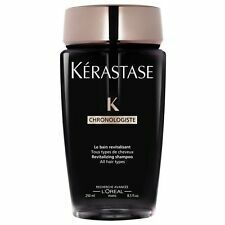 KERASTASE CHRONOLOGISTE PRE-SHAMPHOO 200ml or 6.8oz. "REVITALIZING EXFOLIATING CARE". ALL OF OUR PRODUCTS ARE AUTHENTIC, NEW, FRESHLY IMPORTED . 5 out of 5 stars - KERASTASE CHRONOLOGISTE PRE SHAMPOO, REVITALIZING EXFOLIATING CARE, 200ml/6.8oz! 9 product ratings9 product ratings - KERASTASE CHRONOLOGISTE PRE SHAMPOO, REVITALIZING EXFOLIATING CARE, 200ml/6.8oz! BAIN CHROMA CAPTIVE. Hair is left clean, soft, preserving the color intensity. Protective coating color shine for colored hair. The depth of the hair is preserved. Carry out a second application and leave on for 3 minutes. Kerastase Bain Divalent Shampoo 8.5 oz. Ideal for oily hair, Kerastase Specifique Bain Divalent shampoo gently cleanses your locks while stripping away impurities. 100% authentic. We are very serious against false claims. Any attempts with intend to manipulate our system will result in appropriate repercussions. It specifically targets fragile areas of the scalp and provides them with essential nutrition to make them rich and vibrant once again. A fantastic shine can be achieved through this shampoo with its inclusion of a lipid agent that evens out the entire surface for a complete, natural aesthetic. Kerastase Reflection Bain Chromatique is a colour radiance protective shampoo. This colour protect formula was inspired by chromatic sciences enriched by System Capture for protection intensity and shine. KERASTASE - Nutritive Bain Satin 1 - Exceptional Shampoo - 250ml/8.5fl.oz. KÉRASTASE - Nutritive Bain Satin 1 Exceptional Nutrition Shampoo - 250ml/8.5oz. Exceptional nutrition shampoo for normal to slightly dry hair. 100% genuine, professional hair salon product. Kerastase Chronologiste Revitalizing Exfoliating Care 6.8oz/200ml. Revitalizing exfoliating care. Soft texture for a revitalizing massage. (excludes samples). We are very serious against false claims. Kerastase Chronologiste Revitalizing Shampoo 8.5oz/250ml. We are very serious against false claims. Any attempts with intend to manipulate our system will result in appropriate repercussions. (excludes samples). KERASTASE SPECIFIQUE BAIN DIVALENT. Treat oily roots and dry ends with the Specifique Bain Divalent Shampoo from Kérastase. Free from silicon, you can expect shiny and revitalised locks. Its soothing formula will leave your scalp fresh and re-oxygenated whilst your hair will feel clean, nourished and beautiful once more. Gently cleanses while providing optimal fiber nutrition to dry hair. Emulsify and rinse thoroughly. Leaves hair smooth, soft and supple without unwanted weight. Its soothing formula will leave your scalp fresh and re-oxygenated whilst your hair will feel clean, nourished and beautiful once more. Bain Divalent cleanses and balances your scalp whilst detangling and nourishing your hair to leave it feeling fresh and re-energised. Kerastase Reflection Bain Chromatique Sulfate Free Shampoo 8.5 oz. Even the best hair color products can leave tresses looking and feeling processed. Kerastase Reflection Bain Chromatique No Sulfate gently cleanses and clarifies while infusing locks with healthy hydration to keep your hue looking radiant. 5 out of 5 stars - Kerastase Reflection Bain Chromatique Sulfate Free Shampoo 8.5 oz. 1 product rating1 product ratings - Kerastase Reflection Bain Chromatique Sulfate Free Shampoo 8.5 oz. BAIN CRISTAL RICHE. Más de 35 años en el sector de la peluquería. Los Gastos de envio Nacionales sí calcularán ACORDE al peso del articulo / Adquirido os / os basándose en la siguiente tabla L ista de Favoritos! We can make an exception and send it without signature conformation! Just let us know! Kerastase Aura Botanica Bain Micellaire Riche 2.71oz/80ml (TRAVEL). Anti-frizz effect. We are very serious against false claims. Any attempts with intend to manipulate our system will result in appropriate repercussions. 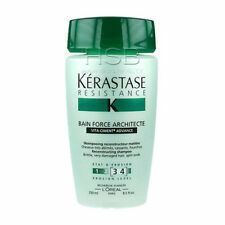 Resistance Bain De Force Architecte Reconstructing Shampoo is a hair-rebuilding and reinforcing shampoo. Use a patch test and stop using if any allergic reaction, irritation, or excessive dryness occurs. KERASTASE REFLECTION BAIN CHROMATIQUE RICHE. Kerastase Bain Chromatique Riche is created specifically for very sensitized colored hair. While protecting the color treated hair this shampoo will gently remove impurities leaving the hair with a luminous, mirror-like shine. $Kerastase Chronologiste Le Bain Revitalisant Revitalizing Shampoo 250ml / 8.5oz Kerastase Bain Chronologiste Revitalizing Shampoo clenases the hair and scalp of all impurities and residue beacuse of is advanced formula enriched with precious active ingredients, Bain Revitalisant sublimates all hair types like never before. Its purifying action cleanses scalp impurities as it smoothes the hair fiber. This cleanser combines smoothness and nutrition and it envelops the hair while remaining supple and soft. KERASTASE SPECIFIQUE BAIN DIVALENT. Kerastase Bain Divalent is a care shampoo designed specifically for oily scalp and dry ends. In the result scalp feels clean and neat and hair is left smooth, shiny with airy lightness. $Kerastase Elixir Ultime Oleo Complexe Sublime Cleansing Oil 250ml/8.5 fl.oz Discover perfection with this Elixir Ultime by Kerastase. Only content with excellence, Kerastase have selected the most lavish oils in their highest concentration to create a unique and indulgent in-salon experience just for you. A shampoo that is luxurious, precious and as pure as gold, Elixir Ultime is created to work amazingly on all hair types, giving glamour worthy results. Silicone and Paraben free, you can receive the best treatment for your hair without any harmful ingredients; you know that you're only getting the best. This oil-enriched shampoo will provide you with the most luxurious cleansing experience and have you feeling like royalty. Reflection Bain Chromatique Multi-Protecting Shampoo (Colour-Treated or Highlighted Hair) 250ml. A sulfate-free multi-protecting shampoo. Leaves hair soft smooth & shiny with vibrant & healthy color. A nutritive daily shampoo for severely dried-out hair. Contains Benjoin Resin generated by the Benjoin tree able to recreate nutrition from within. Loaded with Ceramide to protect hair fiber. Leaves hair soft smooth & shiny. This luxurious shampoo will gently nourish whilst smoothing and protecting your hair fibre leave your hair feeling soft, supple, and boasting intense shine. Apply a quarter-sized amount to wet hair and scalp. Reflection Bain Chroma Riche Luminous Softening Shampoo (For Highlighted or Very Sensitised Color-Treated Hair) 250ml. To use: Apply moderate amount to damp hair massage in. Emulsify & rinse well. kerastase Resistance Bain Volumifque 250 ml 8.5 fl.oz Creamy shampoo designed to shape hair and give an exceptional volume and density from root to tip . Formed even long hair , her oplatnyava possible. Technology cationic polymer that strengthens the vulnerable areas in the hair and makes it thick , strong , light and glossy finish. The innovative formula works inside the hair and strengthen its structure thereby garatira form lasting throughout the day. Discipline Bain Fluidealiste Smooth-In-Motion Shampoo (For All Unruly Hair) 250ml. A smoothing shampoo for unruly hair. Leaves hair sleek shiny & manageable. $Kerastase Reflection Bain Chroma Riche Shampoo 250ml / 8.5oz Kerastase Reflection Bain Chroma Riche - Luminous Softening Shampoo is for highlighted or sensitized, color-treated hair. The hair fiber is gently cleansed and protected from external aggressions. Hair feels moisturized and supple to the touch with added softness and shine. Nutritive Bain Satin 2 Exceptional Nutrition Shampoo (For Dry, Sensitised Hair) 250ml. A nutritive shampoo for dry sensitized hair. Leaves hair soft shiny & manageable. It is great for fine hair as it won't be left feeling weighed down and will give a silky salon finish. Your hair will feel rich to touch and has a luxurious shine! Apply a quarter-sized amount to wet hair. Bain Force Architecte. We are an officially authorised Kerastase Salon. Smoothes and protects the surface while reconstructing the hair fiber intensifying its strength from root to end. Unwanted - Not Wanted. Kerastase (3). Gently cleanses and nourishes hair, providing optimal hair fibre nutrition. Indications: Lasting nutrition for dry sensitised hair. Directions: Apply to wet hair. Hair Accessories (3). Product Details. Declaration Notices: on parcels cannot be declared at a lower value. All orders will be declared at cost price. Kerastase Discipline Bain Fluidealiste Smooth-In-Motion Shampoo (For All Unruly Hair) 250ml/8.5oz. Declaration Notices: on parcels cannot be declared at a lower value. All orders will be declared at cost price. Kerastase Nutritive Bain Satin 2 Exceptional Nutrition Shampoo (For Dry Sensitised Hair) 250ml/8.5oz. Category Hair Care. Declaration Notices: on parcels cannot be declared at a lower value. All orders will be declared at cost price.